Experience a Finnish way to enjoy a delicious meal at campfire and the warmth of an open fire outside, under the stars. The chef prepares you a real dining experience with an open fire. 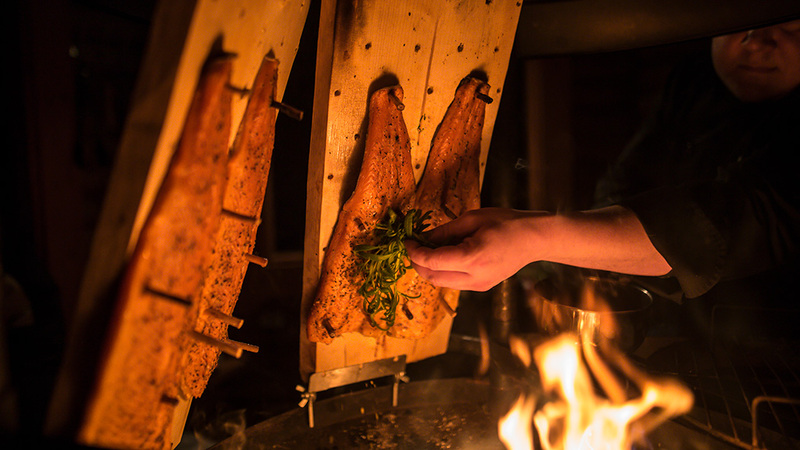 While waiting for a meal, you can enjoy the warmth of the fire and the tranquility of nature, and the delicious smell of salmon flocked on the reindeer. At the same time, you can follow the work of our chef and learn the secret of salmon weaving yourself. Fresh and good quality of Finnish food guarantee a delicious taste experience. In addition to salmon cooked dill potatoes, tomato, salad, feta cheese, onion and sour cream sauce make the meal delicious. With salmon you can choose your favorite side dishes from different salads. Lagrima Arctica, a spruce-sparkling drink served as a starter, makes the meal even more festive. Lagrima Arctica, an arctic tear, is a Finnish banquet drink with a combination of citrus-fresh honey, a touch of ginger and a unique spruce. This sparkling drink is Finnish product and unique in taste. As a drink with salmon, we also serve Finnish blueberry-lingonberry juice, prepared by the local Vavesaaren farm company. Juice is a natural preservative-free product and exquisitely emphasizes the taste of food. For dessert, we offer coffee made in fire camp and pancakes with cloudberry jam. Food is made with fire and is served in a hut at the shore of Lake Soukkio. The hut is located 400m from Soukkio, Lempi and Tiilikka cottages and 800m from the Kiviniemi cottage. You can walk or kick sled short way to the hut in the moonlight, which is also an experience itself. On the way to the hut you can also stop, just listen to the silence and enjoy the peace of the moment. Starting place: The shore of your rental cottage by Lake Soukkio. Price: 390 € / group. Salmon operating days and the time can be changed separately by prior arrangement and subject to availability during holidays. Request of a customized offer or longer bookings to Rock and Lake sales. Please call +358 50 566 0905 or send an email to sales@rockandlake.com. Ask availability for this activity also within other cottages or in different location.